Day camp is the perfect answer for busy dog owners. 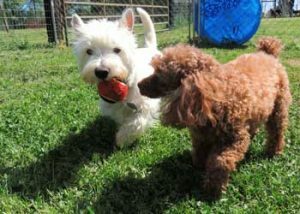 Why have your dog crated or alone all day when they can play with friends! Why worry about coming home to chewed furniture or shoes; or coming home to a dog full of energy and ready for play when you’ve had a busy day and just want to relax. Let us help! Situated on 10 acres, Sheba’s has ample room for your dog camper to run and socialize in a supervised, safe and structured environment – much like a dog park – but with trained staff. We have large, fenced play yards with natural, non-pesticide green grass for your camper(s) to enjoy. While at Sheba’s, your camper enjoys Meet & Greets, off leash group play, interactive games like fetch, frisbee fun, pool and water play, doggy ladder time and more! Socialization and exercise equals a happy and tired pup which we all know also means a happy owner. 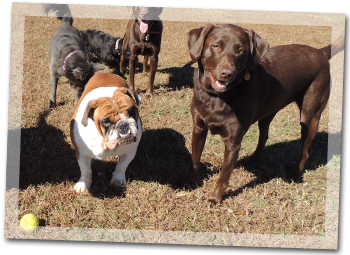 We are members of the doggy day care association – The Dog Gurus – to ensure our procedures and policies meet or exceed doggy day care industry standards; ensuring a safe and healthy environment for all of our campers. All dogs must be social and non-aggressive towards people or other dogs; and successfully pass a temperament test. New client orientations required. Call to schedule. All campers must be up-to-date on all vaccinations (DHPP, rabies and bordetella). Bordetella must be administered a minimum of ten days prior to participation. Titers are accepted. Sheba’s reserves the right to terminate participation based on behavior or for any reason determined by management. Complimentary Shuttle Service available. Certain days/times. Must be in our service area. Special rates available for owner drop offs and pickups 10:00 – 2:00 or for shuttles within a certain radius.